We would like to think people wait until they make it into the office before they check their email. However, when it comes to the year 2018, your mobile phone is more than likely the first and last thing they look at each day. This means that 71% of the time your emails don’t make it until 8:00 am before they get deleted. So how can you make sure your company’s email will survive the inbox? Email used to be one of the primary channels for a company to communicate with its consumers. Now, you have to compete with social media for the promo codes and daily deals that used to only be found in that morning email. So, how can you make sure your email not only gets opened, but also read? We have some easy tips for you to implement to get the clicks you need on your next email. When it comes to the design of your email, simpler is better. Consumers want easy to scan emails. Break up your email into easy to read “buckets” of information with compelling headlines. When it comes to design there is one important thing to keep in mind. Design for the small screen first. Did you know 75% of consumers are highly likely to delete an email that doesn’t render well on mobile? The subject line is the single most important part of an email. If you can capture your readers attention by the first few words your reader sees, you have won the email game. Here are some ways to do that. Use persuasive words like ‘New’ and ‘Free’. People are craving the next, best thing. They want to be one of the first people to know/use whatever it is that is coming out. You will always see an increase in your open rates by personalizing your customer’s emails. They want to see their name in that subject line. If you want to see your open rates increase by 11%, use words like ‘secret’ or ‘sneak peak’. If they think they are getting an inside look, they’ll want to see what you’re offering. Consumers don’t want to be confused by what they are supposed to do while reading an email. Click here, buy this, and watch that. Your email should have one single call to action. This can increase your clicks by up to 371%, getting more people to your site and willing to buy your products. After you create a simple designed email, leave your customer with the next, single step. So, the headline of your email was intriguing enough that your consumers opened their email. Now you need something to keep their attention. Videos in emails can increase clicks, shares, and forwards. Whether you want a quick flip gram of your company’s newest products or the funny GIF of that blonde guy blinking, these types of content will freshen up your emails and catch your consumer’s eye. Did we mention videos are proven to increase email conversions by 130%? Time to find a funny meme. People don’t want to feel as though you are talking to their email address. Consumers should feel like they are part of a community and a valued member of your “family”. This can also be referred to as “tribe marketing.” Email marketing is a great way to create a tribe with your customer base. The more you make your customers feel as though they are a part of something exclusive, the more likely they are to show loyalty to your brand and return to your business, time and time again. So, how can you make sure to get the conversions and opens your marketing director is looking for from their emails? Entice your readers in the subject line. Clarify a single call to action. Speak to the reader, not the email address. 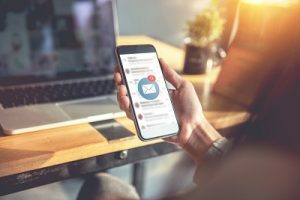 If you can do these easy four things, then within no time you should see your emails surviving the inbox and living to see another reader.